Dr. Pham Thanh Phong has had over 50 articles published in noted scientific journals. 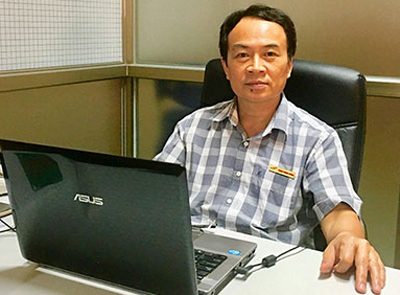 A Vietnamese professor has been recognized for his outstanding contribution to reviewing scholarly works by a leading scientific publisher from the Netherlands. Dr. Pham Thanh Phong, acting director of the Advanced Institute of Materials Science at Ton Duc Thang University (TDTU), has been honored with the “Outstanding Contribution in Reviewing” award by the Dutch publisher Elsevier. The award is decided by five scientific journals in the fields of physics and materials science. “It is a great honor that the editorial boards of the five journals have recognized me for my modest contributions. This honor is not only for me but also for my colleagues who supported me. Without them, I wouldn’t be where I am today,” Phong said. Phong obtained his PhD degree in Materials Science at Institute of Materials Science, Vietnam Academy of Science and Technology, and has published 52 articles in prestigious ISI journals. Elsevier is considered one of the world’s leading publishers for scientific credentials. Only eminent scientists can be invited to be peer reviewers for the prestigious journals of Elsevier; and only reviewers with outstanding contributions are bestowed with the “Outstanding Reviewer” award. Peer review plays a central role in scholarly publishing by validating research, establishing methods by which a research can be evaluated, and enhancing networking possibilities within research communities.